Teladoc, the Dallas-based company that sued Texas over its telemedicine regulations, has a new ally in the Federal Trade Commission. 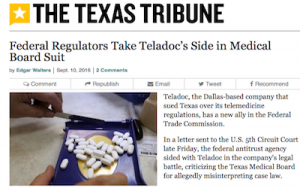 In a letter sent to the U.S. 5th Circuit Court late Friday, the federal antitrust agency sided with Teladoc in the company’s legal battle, criticizing the Texas Medical Board for allegedly misinterpreting case law. The telehealth company sued last year to block board rules that in most cases require face-to-face contact between a patient and a physician before a physician can issue a prescription. That threatened Teladoc’s business model, which virtually connects Texas patients to remote, Texas-licensed doctors, some of whom are based out-of-state. The company says its physicians consult patients over the phone for routine medical issues, and patients can upload photos or other information describing their symptoms and medical history.